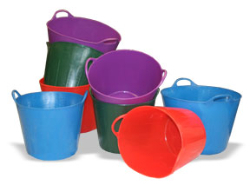 Lightweight polyethylene FlexTubs are flexible, frost and UV proof, and are available in fresh bright colors. Great for gardening jobs of all kinds. Holding both handles creates a pouring spout that is perfect for dispensing chips,compost or compost or liquids. Designed to withstand the toughest conditions and for multipurpose uses in the home, barn, jobsite, and on the road. There is no limit to what they can be used for: general all-purpose buckets, weed and trimming collector, laundry baskets, pet beds, storage containers, cement mixer, mulch spreader between plants, compost mixer, tool carrier, recycling carrier, toy storage, soaking bucket, animal feed and water bucket, apple basket, crop gatherer, and many many more uses!